The throat chakra, the fifth chakra, referred to as Vishudda in Sanskrit is located in the center of the throat. Just as with the other chakras, the energy flows out of the front of the body and out of the back as well, so a vortex is formed under the chin and a smaller one at the back of the neck. This chakra is connected with all forms of expression, communication and speech. 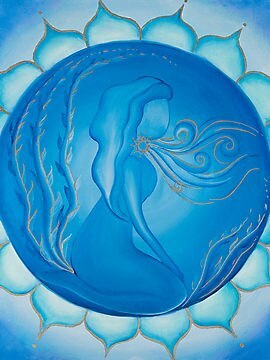 The throat chakra helps is with ones ability to communicate with that which is inside yourself and will help all communications with others to be harmonious. It can also help you be more creative in general but especially with your words. With this chakra blocked however the psychological aspects include obsession, repression of speech, not saying what you need to say, creative blocks and a general inability to express yourself.